"At dawn in Oakland in the cold of the year I was born, January 7th, with the sun before rising or just below the horizon in the false dawn and Saturn in his own house, in Capricorn. But that is according to the old astrological convention. Actually, the sun has advanced; the winter solstice has progresst to the sign of Sagittarius. I was born in the head of the archer." -Robert Duncan, "A Sequence of Poems for H.D. 's Birthday"
He was case number 27,436 at the Children's Home Society. Though he would later be known as Robert Symmes, and later still as Robert Duncan, at birth he was given the name Edward Howe Duncan in honor of his father, a railroad engineer on the Southern Pacific line. What evidence remains of the elder Edward Duncan is his careful rounded signature on his wife's interment papers in Oakland, California's Mountain View Cemetery, dated February 23, 1919. Marguerite Duncan hadn't intended to deliver her tenth child at home, but she had been ill, and a local hospital refused to admit her, fearing that she was infected with the Spanish influenza, which had reached epidemic proportions since its onset in spring 1918 and would kill nearly 20 million people worldwide by the winter of 1919. The 1919 flu strain killed pregnant women in unusually high numbers, but other factors probably contributed to Marguerite's death some hours after her son's birth on January 7. She was a small woman in her late thirties who had already given birth to nine children, two of whom had been stillborn. Though accounts of the morning vary, the home delivery was probably overseen by a Dr. Woods, aided by the older Duncan girls and one of Marguerite's nieces. Duncan's sister Anne conjured the scene some sixty years later: "I stood at the foot of my mother's bed and watched Robert being born. I was two years old, and I remember a great deal of blood and water. He was born at six o'clock in the morning and mother died, I think, at four o'clock the same afternoon." The Duncans then lived at 2532 Twelfth Avenue, in the San Antonio neighborhood of Oakland, a landscape steeped in literary lore. During the 1880s, the young Gertrude Stein had lived here, where houses stood on lots once owned by Spanish rancher Luis Peralta. With a steep triangular roof that loomed above the properties on either side, 2532 Twelfth Avenue had been built during the first wave of the neighborhood's development. The residence had probably once been the main house of a dairy estate, and the property still included a flat-roofed barn. While the house was sizable by city standards, it likely provided cramped quarters for the nine Duncans. From the front porch, its tenants entered a high-ceilinged foyer with a stairwell and adjoining living room. Behind the living room was a dining room, and beside it, a narrow brick kitchen with a wood-burning stove. The second floor contained two bedrooms, the larger to the back and the smaller to the front. After Robert's birth, the house had to accommodate not only the Duncans but also a woman named Mae, who apparently consoled Edward Duncan after the loss of his wife and who brought two children of her own. The two oldest Duncan daughters, Edna and Marguerite, cared for their newborn brother, but before long, eighteen-year-old Edna fled the crowded household. Family legend held that the elder Edward Duncan "went into shock that lasted for months" after Marguerite died. Ultimately, he could no longer manage the children's care, and the entire Duncan brood was effectively orphaned by late 1919 or 1920. Duncan later heard pieces of the story from his adoptive parents: "For six months my father, the other Edward Howard Duncan, might have kept me and my two older sisters cared for me. But my father was poor, a common day-laborer. He could not afford it. Then, there must have been a period in a hospital, awaiting adoption." Edward Duncan's tenuous relationship with his wife's family seemed to play a role in the abandonment as well. Marguerite's brother WesleyCarpenter and his wife, Myrtle, offered to take responsibility for the three youngest Duncan children. Welsey, a meter reader for the Pacific Gas and Electric Company, had the financial resources to take on his sister's children. With little explanation, Edward Duncan refused their offer. As one of Robert Duncan's biological sisters later explained to him, "All four of Momma's sisters had wanted to adopt any of us that Dad wasn't going to keep, so that we would not be separated. Dad's edict was that we were not to go to anyone that was a relative." Relations between the Carpenters and the Duncans had been uneasy from the beginning. Edward had married Marguerite in San Francisco on September 21, 1900, without the blessing of her family, which was perhaps protective of its youngest child. Born in the spring of 1883 in Oakland, Marguerite Pearl Carpenter was nicknamed Daisy. Endowed with a mischievous grin and sharp gray eyes, she was the family gem. Her father, Lewis Carpenter, a native of Kentucky, and her mother, Isabelle McIntee, the daughter of Irish immigrants, passed on to Marguerite the distinct Anglo-Irish Carpenter characteristics that she would in turn pass on to her eight children. They were stocky people with unruly chestnut-brown hair and broad faces, proud to be part of a lineage dubbed by genealogists "the family of heroes." The first Carpenters to come to America-both named William-arrived in the colonies in the early seventeenth century. One landed in Providence, Rhode Island, in 1636; the other sailed into a Massachusetts harbor on the Bevis two years later. Robert Duncan was a descendant of the latter, though at various points in his autobiographical writings he claimed descent from both. The William Carpenter of Duncan's lineage was born in England in 1605 and arrived in America at the age of thirty-three with his wife, Abigal. He settled in Weymouth, where he served as a representative to Massachusetts's general court in Boston. His children, grandchildren, and great-grandchildren eventually scattered throughout Massachusetts, Rhode Island, Missouri, and Kentucky, where, in 1833, Robert Duncan's maternal grandfather, Lewis Whipple Carpenter, was born to Whipple Carpenter and Elizabeth True. After the death of their mother in 1850, the teenaged Lewis and his brother Milton made their way west from Savannah, Missouri, to San Francisco. Lewis Carpenter, who later garnered a reputation as an eccentric naturalist, set off without horse or wagon, trekking across the Great Plains on foot. Some years after Lewis Carpenter's arrival in San Francisco and his marriage to Isabelle McIntee, he and his family moved to a house on Ninth Avenue in East Oakland, just above the Lake Merritt district. Carpenter spent the next several years working at various trades and moving his family from neighborhood to neighborhood as the boundaries of Oakland expanded. He and Milton worked for several years in a broom-making factory. Later, he ran a dairy with his sons Lewis and Wesley, and still later he worked as a house painter. When he died in 1924 at ninety-one, he was buried next to his wife and their daughter Marguerite in Oakland's Mountain View Cemetery. This definitive biography gives a brilliant account of the life and art of Robert Duncan (1919–1988), one of America’s great postwar poets. Lisa Jarnot takes us from Duncan’s birth in Oakland, California, through his childhood in an eccentrically Theosophist household, to his life in San Francisco as an openly gay man who became an inspirational figure for the many poets and painters who gathered around him. Weaving together quotations from Duncan’s notebooks and interviews with those who knew him, Jarnot vividly describes his life on the West Coast and in New York City and his encounters with luminaries such as Henry Miller, Anaïs Nin, Tennessee Williams, James Baldwin, Paul Goodman, Michael McClure, H.D., William Carlos Williams, Denise Levertov, Robert Creeley, and Charles Olson. Lisa Jarnot is a poet and independent scholar. She has taught at Brooklyn College and the Naropa Institute and is the author of four books of poetry, including Ring of Fire and Night Scenes. “This is a book of wonders, beautifully written and brilliantly researched. Lisa Jarnot offers a work of devotion to the truth and spirit of Robert Duncan's life and art, the result of twenty years of study and reflection. A great story as well as a rigorous exploration of the poet's art of the imagination, it will pull readers back into Duncan's poetry at the same time that it recounts his rich, adventurous, and always creative life.”—Robert Adamson, author of The Goldfinches of Baghdad. 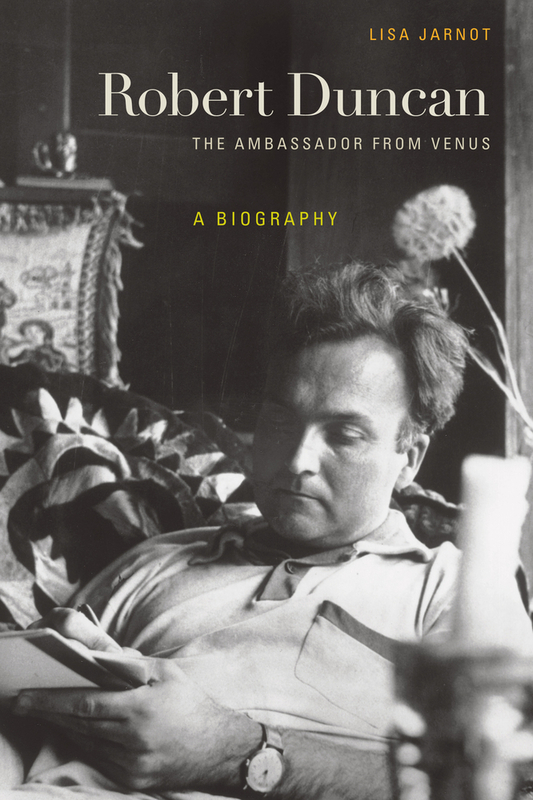 "Lisa Jarnot’s biography of Robert Duncan represents an essential contribution to our understanding of this complex, inspirited man, his life and art, and the many circles in which he moved through the years. It is one of those rare works that melds scholarly diligence with poetic comprehension. "—Michael Palmer, author of Thread. "Robert Duncan was a poet of enormous means and complexity, one of the last to pursue a truly cosmological poetics. In that pursuit he was a poet (even a great poet), who created – like Whitman before him – his own life with all its openings & pitfalls as beyond all else a life-of-poetry. Lisa Jarnot's biography now gives us a first, richly detailed depiction of that life, a powerful and necessary complement to Duncan’s poetry itself. A product of the century behind us, it offers up a lasting legacy for the century to come. "—Jerome Rothenberg, author of Technicians of the Sacred. 2012 PROSE AWARD Honorable Mention, Literature, Association of American Publishers, Inc.